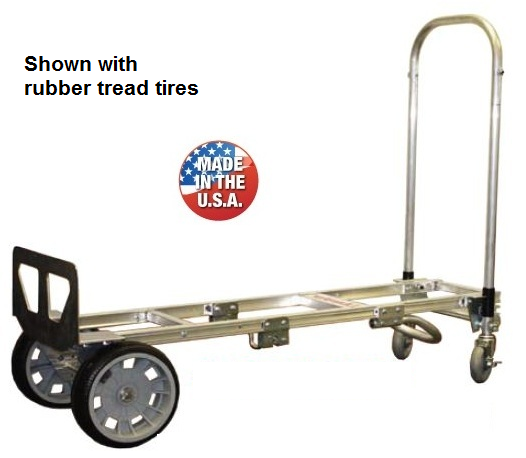 You can now get a great deal on a BP Liberator Senior Convertible Hand Truck! For only $339.99 you can get a Made in the USA convertible truck, more than $100 off the regular price! Choose between a tread rubber or pneumatic tire, same low price. The lock latch assembly is engineered from steel to last - One piece lock bar won't break. Fetures simple design latch assembly with minimal moving parts for maximum reliability - Smoothest release action in the industry. Critical components are steel, not plastic for long life. Heavy duty high tensile steel axle will not bow under maximum loads. • Overall length (platform mode) 56"
• Height as a 2 wheel hand truck 61.5"
• Height as platform truck 46"
• Platform bed length 51.5"